Qt Script provides access to many of the functions supported in the interface. With Qt Script, you can automate a number of Storyboard Pro functions to speed the completion of various repetitive tasks. 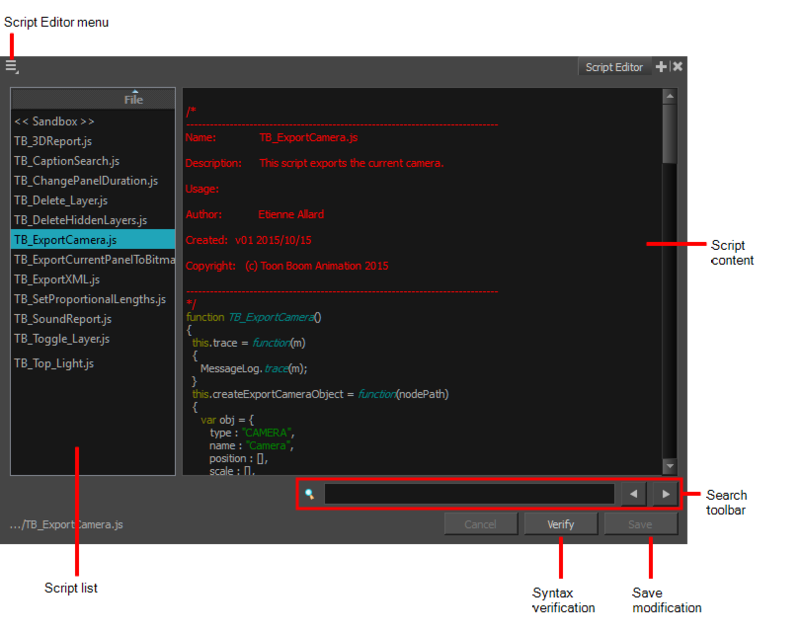 The Script Editor view allows you to edit existing scripts and create new ones. For tasks related to this view, see About Scripting. On the right side of the Script Editor view, the contents of the selected script are displayed and can be edited. The Search toolbar allows you to search a string within the selected script content. You can use the Previous and Next buttons to navigate through the results. This function verifies the syntax of the currently displayed script and lists any errors found. Once you are satisfied with the modifications made to the script, click Save Changes to save the modifications.